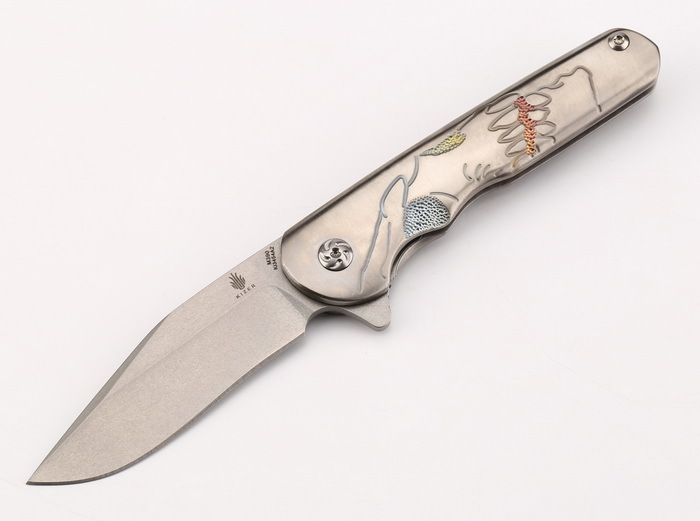 **** Chosen by Winner: Brad S.
This limited edition Dorado is a compact version of the original Matt Cucchiara design and features a Bohler M390 steel blade. The production version of Matt Cucchiara's custom Dorado flipper has exceptional fit and finish. Its contoured titanium handle is satin finished and features Matt's large skull profile, anodized. The matching pocket clip is machined titanium to complement the sleek style of the knife and the tumbled stainless steel blade flies open on a ball-bearing pivot at the push of the flipper. Overall, this is truly a superb folder.